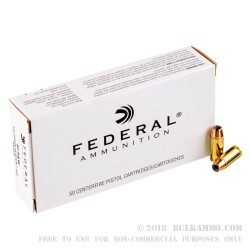 The Federal .40 S&W Law Enforcement rounds are loaded with 155 grain Hi-Shok Jacketed Hollow Point bullets that are extremely well known for their reliable expansion upon impact and superior quality for the price. 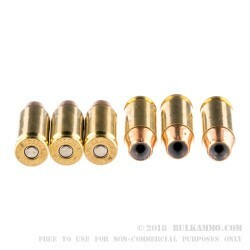 They use brand new USA made high polished brass cases that are reloadable, heavy duty, and are non-corrosively primed with small pistol Boxer primers. This 40 SW load has a serious muzzle energy of 445-foot pounds, and a muzzle velocity that is traveling at a supersonic 1140-feet per second. 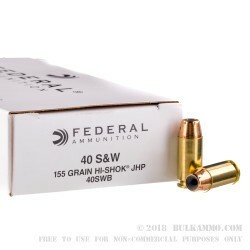 Get your 50 round bulk packs of these Federal Hi-Shok JHP rounds now and make your next trip to the range fun for everyone. 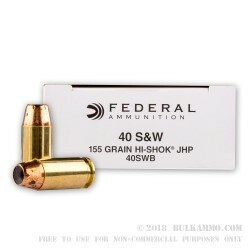 The .40 Smith and Wesson round was developed in 1990 as a compromise between the 9mm Luger cartridge of the time and the 10mm round that had become extremely popular with our FBI or Federal Bureau of Investigation. Not everyone in the FBI could handle the larger more powerful 10mm round so the FBI wanted something that could still perform the same but impart less recoil to the end user. After a lot of testing and research and development, the FBI figured out what combination of factors and components worked best for what they wanted. Then they contact S&W and asked them to carry the torch the rest of the way, the .40 S&W is born from this. The .40 caliber bullet is 0.40” inches in diameter which happens to be 10mm in diameter as well… surprising, right? 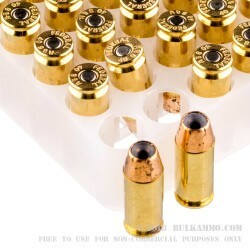 The .40 caliber bullets are available in multiple grain sizes, from 105 grains to 200 grains and on. And it is still in use today by many agencies in the USA. These rounds were a fairly good value, so I bought some thinking I could use them both for practice and self/home defense. AmmoMan shipped quickly, and the ammunition arrived well-packaged.